"Breaking the online dating sound barrier": Badoo & Bumble on sale? It is said, Badoo is backed by Russian Mafia in the spyware business. 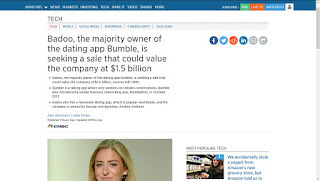 There is NO ROOM for Tinder and Bumble in the same boat, they are in war between them now, so if MTCH acquires Bumble, they will fight between them. Tinder, Match, Meetic, Ourtime, PlentyOfFish, MeetMe (MEET), Hinge, Happn, CoffeeMeetsBagel, OKCupid, Bumble, Zoosk, and many more: in a WAR between themselves, no one will win! Great article about 2017, the whole year "Adulation for Whitney Wolfe Herd"
Match Group still in talks to acquire Bumble with a valuation over USD 1 Billion ?